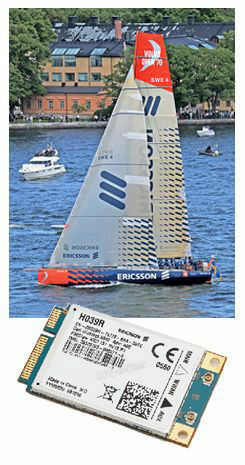 Coltrin & Associates was selected by Ericsson, the world's largest telecommunications network supplier with $27 billion in annual revenue, to promote Ericsson's involvement and sponsorship of two boats in the 2008-2009 Volvo Ocean Race. The around-the-world 37,000 nautical mile yacht race is known as the Everest of competitive sailing. During the race's three-week stopover in Boston, Coltrin & Associates successfully branded Ericsson's participation in the Volvo Ocean Race as a creative and profitable marketing tool for the company to reach new and existing customers around the world, with media coverage including the Associated Press, Boston Globe, Boston Herald and a live interview with Ericsson's CEO on CNBC. When Ericsson announced its new mobile broadband card designed to deal with the issue of non-payment to wireless carriers and the loss of subsidized computers, Coltrin gained nationwide attention for this story through an Associated Press article that was covered by more than 100 broadcast and print media outlets including USA Today, ABC News, MSNBC, FOX News, Forbes, Time Magazine and The New York Times. Additional national, as well as international coverage was achieved through a wide variety of trade publications, including Wired, PC World Magazine, FierceWireless and CNET Asia, to name a few.